SetSail FPB » Blog Archive » Painted or Bare Aluminum? We have been working through the paint or bare question with clients for twenty-plus years. There are many practical reasons for leaving the topside aluminum bare, but you also need to enjoy looking at the boat. These first two photos are of Wind Horse during her first three months out of the build shed. She still has the super shiny new brushed aluminum look. It is very cool, and stands out well amongst rows of painted (or gelcoated) cruising yachts. The photo above is at the end of the summer 2006. Wind Horse has now been out of the shed for seventeen months. Still pretty shiny. 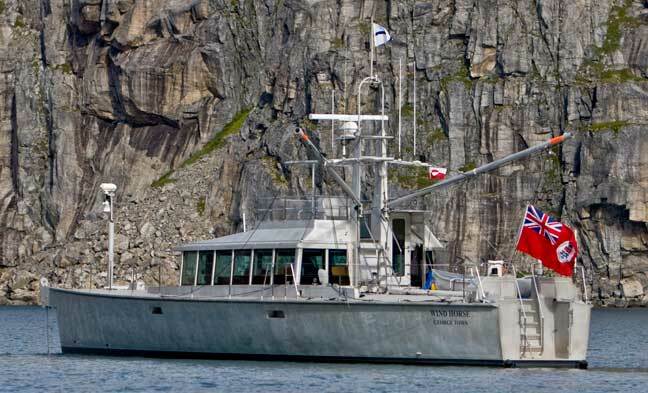 Here she is in Greenland, forty months after hitting salt air. She has now traveled close to 40,000 miles, laid against fenders during in-the-water storage for half of this time, and looks, to our eye at least, pretty good. No worries about rafting against commercial boats. 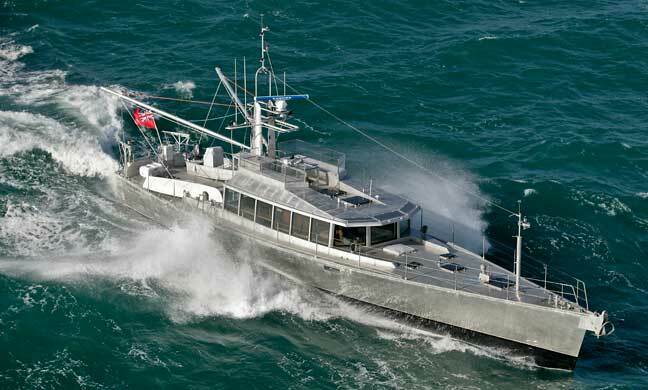 Low-key workboat look (or, at least it does not look like a conventional yacht). Minimal costs associated with maintenance. Tolerates “operator error” and can be touched up or cleaned with a four inch grinder. No periodic repainting the topsides. But what happens if you fall in love with the new boat look and want to keep your FPB shiny? This is easily solved with some young muscle, a bit of scaffolding, and a lot Scotchbrite abrasive pads during haul out. And with the interest earned on the money saved by going bare you can more than pay the yard bill for polishing the topsides. This entry was posted on Saturday, October 15th, 2011 at 12:37 pm and is filed under Dashew Offshore, Design Objectives. Both comments and pings are currently closed.